Ben's Journal: Pick Me! 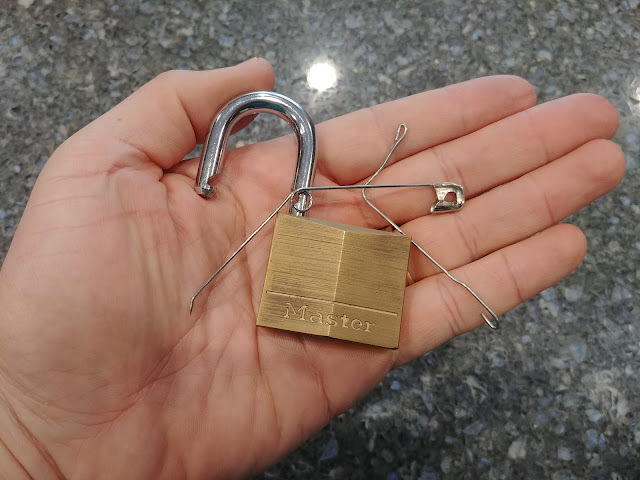 Adventures in improvised lock picking. 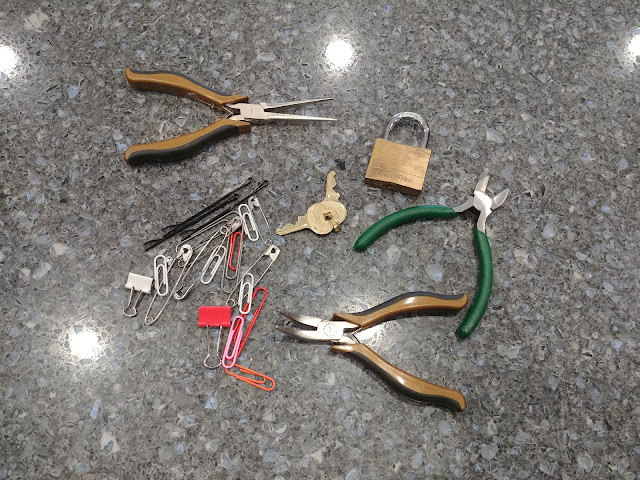 Every so often I pick up my copy of How To Open Locks With Improvised Tools: Practical, Non-Destructive Ways Of Getting Back Into Just About Everything When You Lose Your Keys and get re-inspired to master experiment with lock picking. If you've never considered lock picking, it probably sounds quite devious, though it need not be. With that said, the Commonwealth of Virginia doesn't take kindly to this hobby and considers just owning a set of lock picks as intent to break the law. All isn't lost though, as the point of the book is to use improvised tools. So today I grabbed an old padlock and a bunch of possible materials to turn into lock picking tools and went to work. This act falls squarely in the beginner's luck category. Though, when it comes to defeating locks, I'll take any success I can get. As you can imagine, there are lots of resources on the web to help you learn this skill. And of course, YouTube is your friend. Happy picking!